If a cookbook ever mirrored my personal recipe notebook, this is the one. With few exceptions, every recipe has been simple,adaptable and delicious. This is food I really want to cook every day and probably my most-used cookbook. P44. A simple recipe following the 1:4 ratio. Makes just enough vinaigrette for a salad for 3 or 4. A few simple variations are given; I always add mustard but heavy cream is also a great addition for a milder, creamier dressing. The other suggestions are good reminders to throw in some herbs or garlic if I have some prepared. Great instructions for how to make a vinaigrette without a recipe are given as well. P45. A great use for excess garden herbs. Quick to make. Keeps well. The recipe is loose, depending on what is available, and a few variations are given. Use for roasted chicken, grilled vegetables and fish. Add chopped hard-boiled egg. Yummy on vegetables such as eggplant. Gotta say...really did not like this. You need to add some toppings! P68. Time to make is 4-5 hours, plus cooling and straining. Freezes well. This is the example recipe for the Simple Vegetable Soup, p69, which is a blueprint for making any vegetable soup. P100. Used basmati rice. Foolproof method that might need some flavoring help, but this is a useful recipe if plain rice is needed. Time to make: <1 hour. Leftovers keep well for use in other recipes. One minor variation given. Good, simple, easy to modify. Even add meat and veg to make it a one-pot meal. This is my favorite roast chicken recipe. There's no trussing, no basting,no covering, and very little added fat. The magic is in the cast iron pan, which is essential. It is the most reliable chicken I've had,turns out crisp and juicy every time, and is in a regular rotation during the week. I mix up the spices, put a lemon in it, throw it in that hot pan, and sizzle. p. 110 -- Very basic roast chicken recipe, but the technique involves roasting the bird breast side up for 20 mins, then flipping it to breast side down for 20 minutes, and finishing it breast up again. Doesn't end up looking the prettiest from all that flipping (despite using an oiled and well-seasoned cast iron pan I had a little bit of sticking), and the skin was not as crispy as I like. If I try this technique again, I'll season the chicken a day or two in advance as Waters recommends and see if that makes a difference. This is a great simple recipe for braised chicken legs. I had company with less adventurous food preferences and made this. There were no leftovers! I made this with peaches and blackberries and made it as a cobbler with cream biscuits. The filling wasn't particularly sweet and the black berries and peaches went well together. The blackberries did make the filling an odd color. I really liked the cream biscuits and they really went well with the peaches. p199. Quick to make. Leftovers keep very well for 2 weeks. Use in tarts as well as for a spread; a frosting variation is also given. Very special and flavorful. Substitute any citrus fruit or berries. Everyone in our family gets this cake for their birthday. I have made it several ways - once with 100% ww flour and rapadura. Delicious!! The proportions of this recipe are perfect for a dinner salad for two people. The chicken salad was flavorful. I failed at making the mayo though. p.240. Outstanding complement to pork and squash stew with chiles. Added a squeeze of lime and some grapefruit juice and finely chopped scallions to the vinaigrette, served on bed of torn buttercrunch lettuce. Very light and fresh salad. Dressing is good with a tsp each of honey and dijon mustard. While simple, this was very good. The dressing goes well with both the cherry tomatoes and the green beans. p241. Time to make: <1 hour. 3 variations given, and this is a versatile salad that takes well to experimentation. Try it with other vegetables. It also keeps well. I'm not used to a coleslaw that's dressed with a vinaigrette but it was a nice change. I used white wine vinegar which complimented the cabbage nicely. I also really liked the sliced red onions. While the recipe says it can either be served immediately or later, it substantially improved after a half hour as the cabbage and onions became softer from the salt. This is indeed simple but good. I liked it even better the second day. Lately, all my carrots have had a slight floral bitterness. By the second day, the bitterness was less evident. P245. 10 minutes to make, 10 minutes to develop flavors. I love this. It tastes surprisingly good on sandwiches. Keeps very well. Not many variations--other citrus juices can be used. I think the salad tastes best at its simplest. Note-- cut oil in half. Time to make: >1 hour. Some variations given, especially to make it more substantial. Makes a lot; the broth keeps well. Not suitable for weeknight cooking, but a good soup. p253. page 252. This is an especially light version, with a clear broth; leaving out chipotle makes the most of that. Also oven-toasting rather than frying the tortilla strips (3 tortillas brushed with oil, cut into strips, set on a quarter sheet, and baked at 350F for 17 minutes). Great accompaniment to richer, cheese-y fare. Would use chipotle if making the heftier variation with black beans and chard. P253. If you already have cooked chicken, chicken stock and cooked pasta, this soup is a snap to throw together, perfect for a quick lunch. If you don't have those things on hand, the soup takes a little longer, but I do like the technique of poaching the chicken breast to get both cooked chicken and broth for the soup. Time to make if making the broth: 1 hour. Leftovers keep well. page 254. First thing made from the book, it moved immediately into frequent rotation. Delicious and fortifying in the cold months. Particularly outstanding made with homemade stock, since the ingredients are so few. Perfect accompaniment to poached egg on toast. Replacing potatoes with white beans equally good. Requires dried white beans. A little bland. Agree with Sturlington. Too bland. Surprising, because Alice is usually spot-on; case in point her excellent Turkey Soup with Kale and Spicy Cauliflower Soup. The key to this is to use really good stock, which made this delicate yet delicious. I served it with cheese scones which went perfectly along with a glass of dry white wine. i didn't puree it into a soup and used a ton less water (maybe 1 c. total), but i could see it being delicious as a soup. it had plenty of heat, as i used a tsp. of aji (local bolivian pepper) - and no chili flakes, thank goodness, or it'd been too hot i think. all in all, a great recipe - makes me want to cook more alice waters recipes. P258. Time to make: <1 hour. A small number of variations are given following the recipe. Leftovers keep well. A classic, wonderful soup. p. 258 -- Simple but flavorful. I used light cream and left the soup chunky. Topped with a bit of crumbled bacon and radish sprouts. Recipe requires a mortar and pestle. Made several times. I usually omit the rice, as suggested in the variation. Best with fresh tomatoes (or fresh tomato puree), but can be made with canned tomatoes. Time to make: <1 hour. Leftovers freeze well. A couple of minor variations (serving suggestions, really) are given. Absolutely delicious, especially with garden tomatoes. p261. Made several times. A very versatile sauce with many uses beyond pasta. Good to make with garden tomatoes for freezing, but can also be made with canned tomatoes. Several variations are given. Time to make: <30 minutes. P265. For garden-fresh tomatoes. Time to make: 1hr. Some minor variations are given, but I can think of other uses for this, such as to top bruschetta or grilled fish. P265. A variation of tomato sauce for pasta. Delicious and simple. Time to make: ~30 minutes. Leftovers keep well or can be frozen. Some minor variations are given. P265. A simple recipe, but useful when a quick dinner is required from pantry ingredients, assuming pesto is in the pantry. Suggested variations for filling out the dish with green beans, tomatoes and/or potatoes. P.272. Time to make: ~1 hour.This is about as basic a recipe for mac and cheese as you can get, but it's still delicious. A couple of minor variations are given, and the cheese can be varied as well. I added bacon for even more deliciousness. Leftovers reheat well. Waters' instruction to simmer the farro in a large quantity of water is a much better technique than cooking it as if it were rice. An excellent master recipe with several variations, I plan to put this in permanent rotation. A delicious use for shell beans and green beans, both of which are abundant right now in my August garden. The recipe is quite flexible: I used green Romano beans and fresh cranberry beans and the dish was perfect. So simple, but worth the price of the book. Time to make: less than 30 minutes. This is a very easy way to jazz up plain broccoli, just take it easy on the garlic as it retains its sharp flavor. Some simple adaptations are given, and of course, many more come to mind. Any leftover melted butter could probably be cooled and rolled in wax paper for later use. P294. Excellent and easy way to prepare broccoli. Make sure to season well with salt. This was good, but I think I used a little too much butter and cheese. In the future, I will be more cautious about how much constitutes a bunch. I've found that 2 bunches serves just 2 people. Also, I would halve the butter and cheese. This is a technique, not a recipe. Works well. Some nice variations and serving suggestions are given. Leftovers keep well for use in recipes. P313. p. 317 - used salt-packed capers soaked 20 min. to rinse and drained, fresh parsley and a little dried basil (from garden). Really, really good. I have tried both variations. Par-boiling works best, which makes this a good recipe for leftover boiled potatoes. Always a welcome side or addition to other dishes, such as omelets. Time to make with boiling is around 30-45 minutes. P319. delicious! I used braised white beans instead of chickpeas and they were wonderful too. This is a very good basic recipe, not overly complicated, but very flavorful. Be sure to season as you go along because it will take more salt than you may expect by the time all the veggies are in the pot. I used a large 5 qt. saute pan and it was exactly the right size. P326. My sauce did not get as thick as indicated in the recipe, but I think I used far too much zucchini in proportion to the tomatoes. Never mind, it was still delicious and infused with bacon flavor. This dish keeps well, can be served warm or at room temp, and can be used to top crostini. I think it would also make a good pasta sauce. Very versatile. Excellent! This is my favorite Alice Waters cookbook, all recipes realistic, truly simple, deeply and honestly flavored. p.340. Used a pound container of lump crabmeat from Donald's; made ten two-inch patties. Used saltine cracker crumbs (about 1/4 c in crab mix itself, rest as coating). The four patties coated but uncooked and refrigerated for a day were if anything better than the same-day six, so will not be afraid to do ahead for company. always looking for the perfect meatball...these were pretty close. I used 1 lb. beef and 1/2 lb pork and 1/2 lb lamb. Used day old french bread. Love idea of cooking small amount to taste for flavoring...did fall apart a little while cooking in sauce. Oh well. I baked. p.356. First-ever shanks, so went with most straightforward recipe. Bourgeat braiser is perfect vessel for both browning and oven braising. Removed shanks from broth after cooking, cleaned meat off the bone to store separately overnight. Returned to sauce in fridge after sauce defatted, heated, and pureed (medium disk on food mill). Used all ingredients specified except no bay leaf (unaccountably out), and subbed preserved lemon for fresh in the gremolata. Served over smashed chickpeas. Tasty, but ready for more highly flavored versions next time. Used 8" cast iron per recipe, baked longer than called for and still fell in the middle. Had to put back in the oven for 20 min and, of course, the looks were spoiled. Pineapple better tasting. The recipe says this will make one 9" layer, but if I'd left it in one it would've overtopped my pan. So I poured it into two. The batter is alarmingly runny, but it's baked up into perfectly sound, light, tender cake layers. Yum! These are more complex than the standard “candied” nuts recipe. I really like how they have a variety of flavors to compliment the sweet. This recipe isn't in this cookbook. The recipe is one of the variations at the end of the "Vanilla bean ice cream" recipe on page 374, as are most of the other ice cream recipes. Aaaaaaahhhh...strawberry season. Time for some strawberry shortcakes to make an appearance. The soufflé is included as part of a funny spoof Parisian adventure. Like all of AW’s recipes this one is simple, allows you to utilize local, seasonal ingredients and is delicious. It is a real treat to watch a few pounds of apples slowly turn into squares of candy. A genius recipe....ratatouille that fusses only where it needs to fuss (over the eggplant), and adds a few smart, modern details. 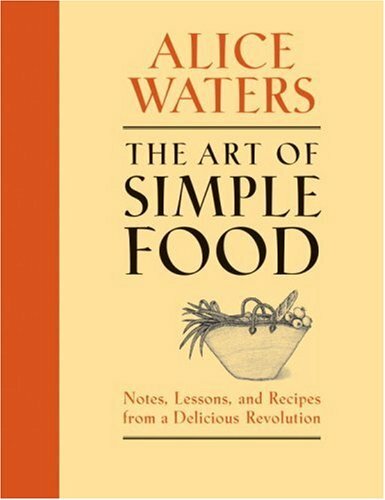 Culinary phenomenon Alice Waters proposes an entirely new way to cook and eat--simple, local, sustainable, and, above all, delicious. With 20 lessons for teaching core principles and over 200 flawless recipes, this is the basic handbook that every cook, new or experienced, must add to his or her collection this year. Perhaps more responsible than anyone for the revolution in the way we eat, cook, and think about food, Alice Waters has "single-handedly chang[ed] the American palate" according to the New York Times. Her simple but inventive dishes focus on a passion for flavor and a reverence for locally produced, seasonal foods. With an essential repertoire of timeless, approachable recipes chosen to enhance and showcase great ingredients, The Art of Simple Food is an indispensable resource for home cooks. Here you will find Alice's philosophy on everything from stocking your kitchen, to mastering fundamentals and preparing delicious, seasonal inspired meals all year long. Always true to her philosophy that a perfect meal is one that's balanced in texture, color, and flavor, Waters helps us embrace the seasons' bounty and make the best choices when selecting ingredients. Fill your market basket with pristine produce, healthful grains, and responsibly raised meat, poultry, and seafood, then embark on a voyage of culinary rediscovery that reminds us that the most gratifying dish is often the least complex. Named the most influential figure in the past 30 years of the American kitchen by Gourmet magazine, ALICE WATERS is the owner of Chez Panisse restaurant and the author of nine cookbooks.